Turn the crown until yesterday's date appears. Continue to turn the crown until the correct time appears. 6. Push the crown back into position I. 1. Pull out the crown to position III (the watch stops). 2. Turn the crown until you reach the correct time. 3. Push the crown back into position I. 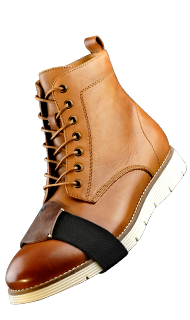 - The minute counter measures 30 minutes per rotation. 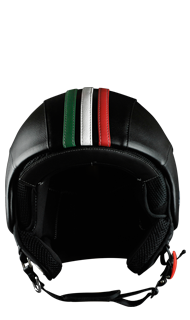 - The center stop-second measures 60 seconds per rotation. - the crown is in position I (=normal position). 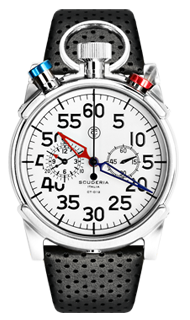 - the three chronograph hands are precisely at zero position following activation of pusher 1. Should this not be the case, the position of the hands must be adjusted (see the chapter entitled “Adjusting the chronograph hands to zero position"). 1. Press pusher 2 to start the center stop-second hand. 2. To stop the timing, press pusher 2 again. 3. To reset the three chronograph hands to zero positioning, press pusher 1. 2. Press pusher 1 to stop the chronograph. 4. Press pusher 2 to stop and the final time is displayed. 5. To reset the three chronograph hands to zero positioning, press pusher 1.
rotates by 360º - corrective mode is activated). the center stop-second hand quickly. Press pusher 1 to advance the next hand. hour counter hand quickly. Press pusher 1 to advance to the next hand. 6. Return the crown to position I. 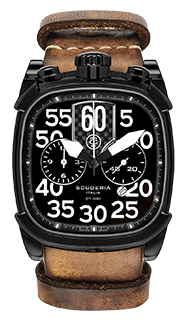 All the CT Scuderia timepieces are designed with a minimum water-resistance rating of 5 ATM (50 m). 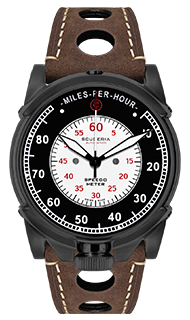 The water-resistance of a timepiece protects the movement from dust, moisture, and risk of damage to the movement should it be immersed in water. Please see chart for guidelines for recommended exposure of various water ratings. 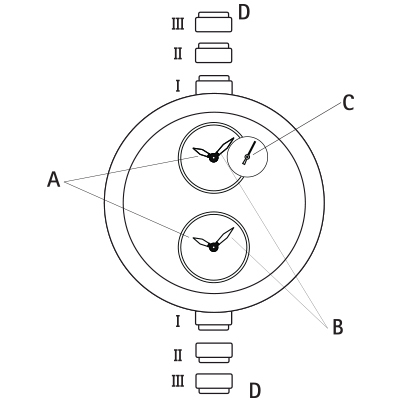 It is important not to attempt to adjust the position of the crown while the timepiece is in contact with water. Water can enter the case causing damage to the movement. 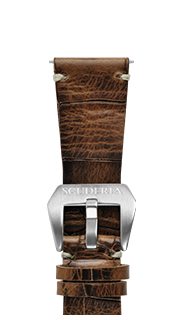 For timepieces with screw-down crowns, it is important to ensure the crown is in the proper position and completely locked before contact with water. 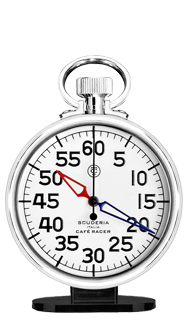 For timepieces with chronograph functions, do not engage the chronograph under water, as water may leak in the case and cause damage to the movement. 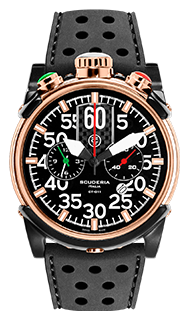 All the CT Scuderia timepieces are designed to withstand use as indicated in the following chart. 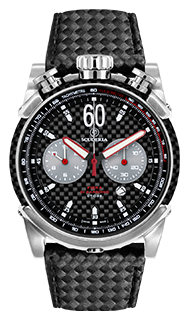 Each CT Scuderia timepiece is designed and manufactured to exceed the highest of standards. 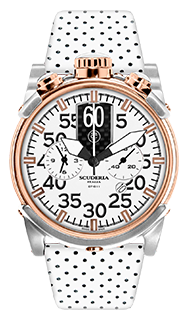 Unlike most other mechanical objects, a watch operates non-stop. 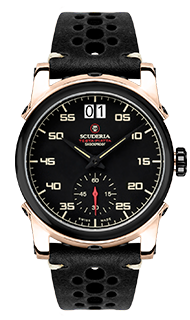 In order to ensure optimal performance and longevity from your timepiece, please review the simple guidelines for care and precautions of your CT Scuderia timepiece. 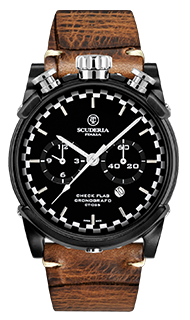 Your timepiece should be cleaned with soft cloth and water only. Do not submerge your time piece. 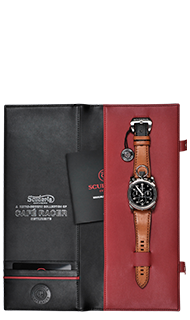 Your timepiece should be rinsed clean and dried with a soft cloth after any saltwater use. In order to maintain the “new look" of metal bracelets, we recommend periodic cleaning of the bracelet. Dip a soft brush in warm soapy water and gently rub bracelet clean. We advise having your timepiece serviced every 18-24 months to ensure long use and trouble free operation. Your timepiece is a complex integration of parts and components brought together by skilled craftsmen. There are certain actions or environmental situations that may damage or impede your timepiece's ability to perform optimally. 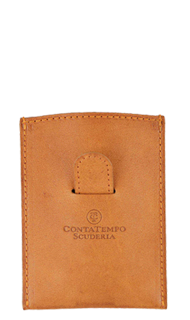 It is important to avoid the following conditions: extreme heat or cold, as well as prolonged periods of exposure to direct sunlight, exposure to extreme heat or cold, as well as prolonged periods of exposure to direct sunlight, exposure to wet conditions that exceed your timepiece's water rating (see case back and chart). Never operate any of the function buttons or crown when timepiece is in contact with water. Your timepiece should not be affected by magnetic fields generated by household items such as televisions and stereos, but avoidance of other strong electric fields static electricity, which may interrupt mechanism, is suggested. It is also important to avoid extreme shock or impact.